6 First, why would you consider buying an Upright Exercise Bike? Exercise bikes are by far our favorite form of Cardio Workout. We want to give you the best information possible to make your next buying choice, so we have review, places to buy and guides on all the top bikes on the market. 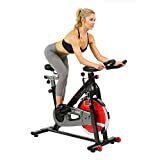 This guide for Exercise Bikes will take you through everything you need to know to buy the best product for you. 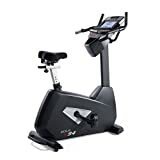 Our site is packed with the best exercise bike reviews, and we have even found the best price deals so you can save money and lose weight. If you are on a limited budget, you don’t have to let that stop you from finding some great workout equipment. 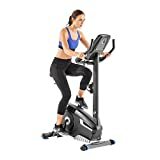 Here are the top selling exercise bikes for under $200, we will then give you our best buy picks. Comfortable and easy to use if you are new to exercise. Generally these bikes have a high weight limit and a good comfortable seat. They do take up a little more space than upright bikes though. This is one of the most sought after affordable folding bikes on the market. 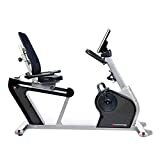 With its comfortable seat and well built design its amazing that Exerpeutic can offer all this for less than $140 including free delivery. 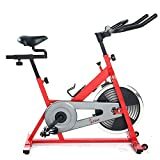 Best Under $200 Indoor/Spin Bike. So there you have it, 3 great affordable exercise bikes that will save you hundreds in gym costs. If you are looking to spend a little more then read on..
Its the little things that makes the difference, and Sole have taken that on board to produce one of the best home Indoor Bikes on the market. We love the smooth feel of the 48lb flywheel that lies at the heart of this bike. It looks good too, with its X Shaped frame and striking red highlights. The little features that we really like are the handle bar mounted bottle racks, and its impressive build quality. First, why would you consider buying an Upright Exercise Bike? Next up is price. 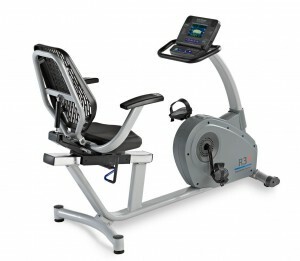 Because they sell in such high volumes it is very easy to find great quality exercise bikes at very affordable prices. You can spend less than $150 on an exercise bike and still see great results. My next door neighbour bought one of the cheapest bikes on the market, and used it every day. He lost over 140lbs in weight, just with that bike and a healthy diet. What we have done to ensure that you don’t end up spending more than you need is to look at the best bikes in each of the price ranges. For each bike we will describe what exactly you are getting for your money, and how it will benefit you. Exercise bikes can be split into four different categories. It is useful if we look at each in a little more depth in order to understand the differences. This is the most common form of exercise bike. Upright bikes feel the most like normal bikes in the way they operate. The saddle is directly above the pedals, and there are comfortable easy to reach handle bars. The bike forces you to sit in a comfortable upright position, which most riders find perfect for long periods of exercise. Pedals on an upright bike are so called free wheel. This means that you can stop turning your legs at any point. On a spin bike this is impossible as the pedals are fixed to the free wheel and turn constantly. Being able to stop pedalling at any point is great if you need to get off the bike for any reason, or just need a quick break. 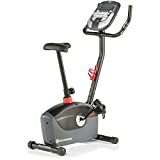 Upright bikes tend to be the best value for money, basic models such as the Exerpeutic Folding Exercise Bike is less than $150. 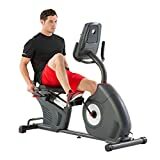 As you can see in the review its basic, yet still good value for money not surprising that its the biggest selling Exercise Bike on the market. Of course if money is no object then Trixter Xdream Exercise Bike combines a top of the range bike with a full virtual reality experience, yours for $6995. A great value mid range bike, ticks all the boxes for modern connectivity. Plus its comfortable, well made and has a great range of workout options. For a bike that won't break the bank look no further. Not as common as upright bikes, yet for us recumbent bikes make the best choice. recumbent means that you lie back on the bike in a comfortable relaxed position. One of the big drawbacks from upright exercise bikes is sitting on the small, sometimes uncomfortable, saddle. 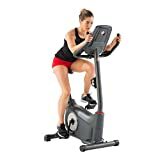 Exercise bikes are the biggest selling form of exercise equipment. This is because they are safe to use, simple to operate and tend not to take up to much space. While prices can range from less than $200 to upto $2000 there is a huge amount of choice depending on your budget. Of course not everyone has unlimited money to invest, so we have grouped our reviews according to price, and features. 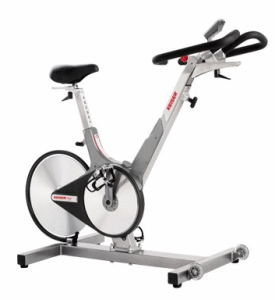 Are you looking for a Spinning Bike, or a more traditional Bike? Spinning bikes have a big heavy flywheel that maintains its momentum, and fixed pedals so you have to keep the legs turning. Traditional Exercise bikes are designed to feel more like a normal outdoor bike. They are smoother and can free wheel. My preference are spin bikes, they give a high intensity workout that melts fat, and pushes the heart to its limits. One of the best there is, at the top of the market comes the Keiser M3 spin bike. Designed for peak performance, this bike will push you to the limits day in and day out without missing a beat. Made from aircraft grade parts, this bike is strong, durable and well worth the ticket price. Incredibly durable, no wearing parts, nearly maintenance free. Modern complementary design, built in the U.S.A.
Computer with power output tracking included at no extra cost. Summary: Sunny Health, although if money was no object then the Keiser M3 is a better bike! 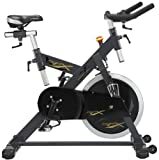 For budget bikes, then for less than $200 the Exerpeutic bikes are hard to beat!